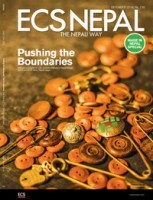 The editors at ECS Magazine asked me to write about the Krishna Temple, and my experience there during the earthquake. This is what I wrote for the December 2016 issue. 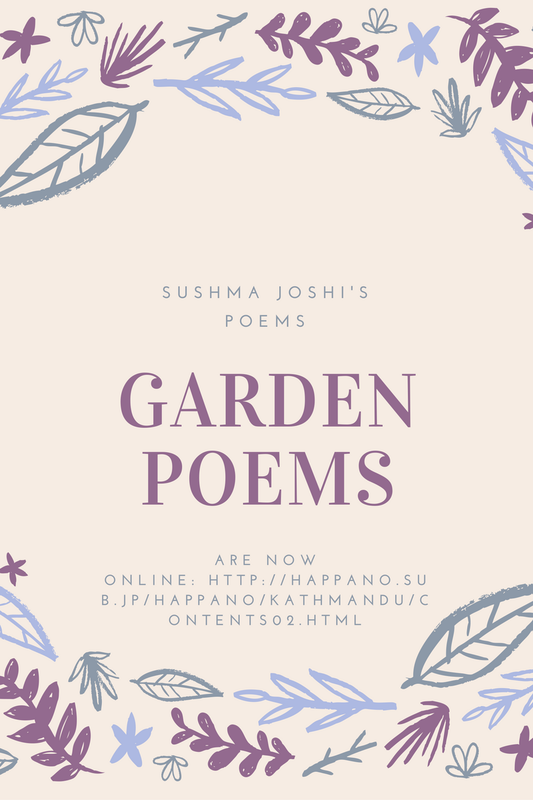 The Kyoto Journal just published two of my poems from my series "Garden Poems". 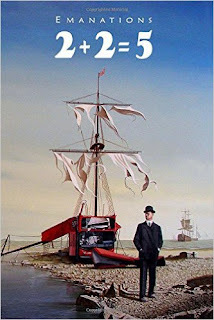 Please buy the journal--its a literary and artistic feast about Asia! And here is the PDF of my two poems, with beautiful illustrations. I was thrilled to receive in the mail a jumbo copy of Emanations! Dear readers! 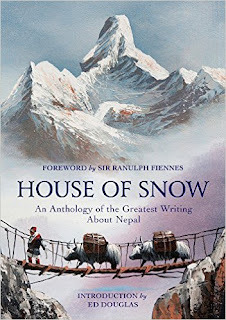 Please do order a copy of "House of Snow," newly published by Head of Zeus in London this August. The anthology looks big and fat, and I'm sure there will be something there for everyone! 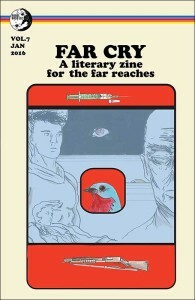 You can also find my short story "After the Floods" in the anthology. All proceeds go to rebuild a school in Gorkha, one of the districts most affected by the 2015 earthquake. I made the collage above 20 years ago, as an undergraduate at Brown University. I was taking a class on digital design and art at Rhode Island School of Design. The collage brings together old photographs of Nagasaki after the atomic bombing. The yellow images at the top are of Fat Man, the bomb that was dropped on the city on August 9th. The bird is the fallen bird of peace. The blue gate symbolizes peace. We cannot go in or out of the gate till we have looked at the horrors of the past, and acknowledged our mistakes. Art Matters: download your copy now from Pustakalaya! Download your copy of Art Matters from Open Learning Exchange's Pustakalaya. यसैमा फेरी खोज्नेAlliance française de Katmandou The book is a compilation of reviews I did for the Nation Weekly Magazine as well as ECS Magazine between 2004-2008. To read my short story "Tom's Diner," go to Cerise Press and click on the link on the right. 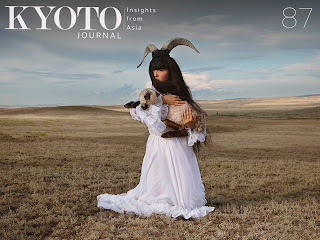 New Asian Writing: "I Woke Up Last Night and I cried"
I found the link to my short story "I woke up last night and I cried" on the New Asian Writing website. It was published in 2010. Short story selected for the 2010 New Asian Writing Short Story Anthology I woke up last night and I cried. This is all too much, I thought. I can’t handle it. My husband’s been gone for six years and he shows no sign of returning. He doesn’t send any money either. Wait till I return, he keeps saying. I’ll return next month, he says. He’s been saying this for a while now. He’s in Saudi Arabia. Jeddah, you ask? Never heard of Jeddah. Bantum? Somewhere. I don’t really know where.